Thanks to everyone that has ordered books in the sale. However, our sale has been so popular that, due to unprecedented demand, we’ve had to suspend sales from the website. We plan to restart our sale early in the week beginning 15th November 2010 so you’ll have to hold your horses until then. 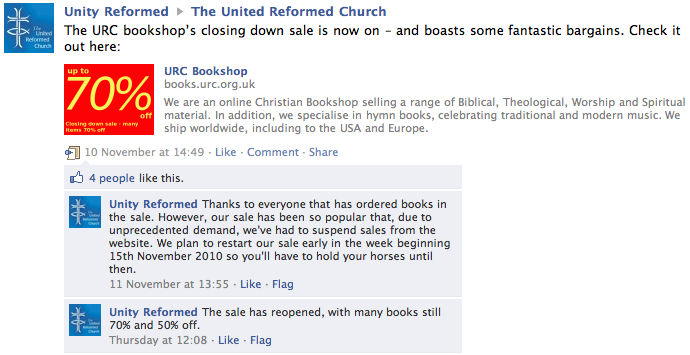 The URC bookshop will be closing at the end of 2010 (see the URC news article) due to financial pressures. Online and phone orders will continue until all stock is sold (orders will be processed subject to availability of stock). Returns will be processed as normal. After the closure of the bookshop, the URC will continue to sell all URC merchandise, including the Year Book, Prayer Handbook and the URC diary.